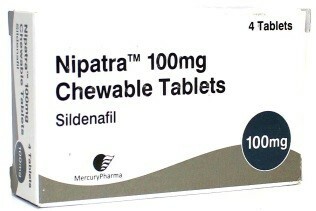 Nipatra is used against Erectile Dysfunction (ED), otherwise known as impotence. It contains the same active ingredient as Viagra, namely sildenafil. Taking Nipatra from half an hour to an hour before sexual activity will help men get and sustain an erection when sexually stimulated. This product is currently unavailable at the pharmacy’s suppliers. Please check here for alternative impotence medicines.